A TRX class offers it all: core strength, balance, flexibility and total-body strength. Some classes are even designed as a cardio-strength circuit, providing bursts of cardio between exercises performed on the TRX trainer, to boost your calorie burn. Exactly how many calories you use depends on the class structure, your intensity and your size. Regardless of calorie-burn rates, though, a TRX class guided by a trained instructor can help you build functional strength to improve sports performance, daily activity and your overall well-being. TRX classes use equipment known as TRX suspension trainers to manipulate your body weight so you build strength and flexibility. The trainers are constructed of industrial-strength nylon webbing that are anchored to any vertical, sturdy site -- such as a pole, ceiling beam or tree branch. A TRX trainer is long and offers two handles that can be adjusted to various heights, so you can do hundreds of exercises with them, regardless of your size or fitness level. A class usually offers a row of the trainers so that multiple people can train at once. The instructor leads you through a warmup and various exercises, depending on the intention of the class. Classes may be designed to build total-body strength; give a comprehensive cardio and strength workout; enhance flexibility; build the core; or develop sport-specific skills, such as golf swings. Calories burned are a reflection of energy expenditure. When you have a larger engine, or body size, you burn more calories. For example, a 125-pound woman might burn 275 calories in a one-hour moderate calisthenics-style TRX class that involves basic moves such as pullups, pushups and planks, while a 180-pound man might burn 400 calories in the same class. Keep this difference in mind when you see calorie-burns listed on a class schedule. Consider how your weight compares to the body on which stats are based. The harder your work, the more calories you burn. If the TRX class is set up as a circuit, in which you do a set of exercises using the trainer and then do a minute or two of high-intensity cardio work, such as jumping jacks, jump squats or football runs, you could burn between 480 and 700 calories per hour, depending on your size. A class that mimics classic weight training, consisting of two to three sets of 6 to 12 repetitions of one exercise -- such as rows -- followed by a 30- to 60-second recovery between sets that addresses all the major muscle groups will burn around 180 to 266 calories per hour. A TRX class that involves a rigorous circuit of strength exercises where there are no breaks between sets of exercises, you'll likely burn more calories -- between 360 and 500. If you're attending a TRX class based on flexiblity to enhance yoga or Pilates training, expect your calorie burn to be between 240 to 350 calories per hour-long class. 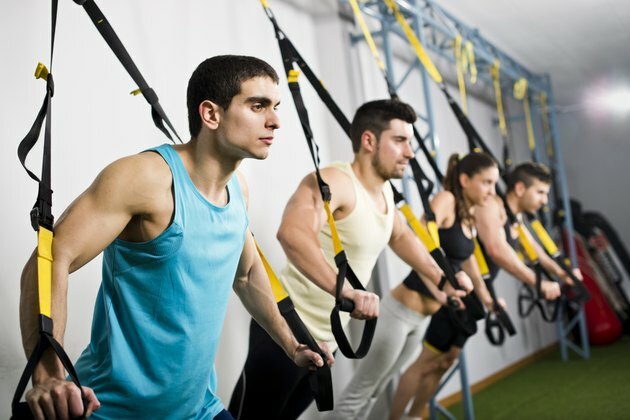 TRX classes vary in which exercises are offered as the instructor tailors each class to the participants' abilities and goals. A sample TRX class that involves one minute each of low rows, TRX squats, squats to row, squat jumps, chest presses, cycle jumps and front squats; repeated as a circuit three times with a 30-second break between each circuit burns 455 calories for a 180-pound man. Attend another class that has you do three visits to a circuit of right, then left, TRX sprinter starts; high knees with the TRX trainer; low TRX rows; TRX squat jumps; and TRX atomic pushups for a minute each with a 30-second break between each round of exercises burns 380 calories for a 180-pound man. Each of these workouts takes about 30 minutes to complete with warm up and cool down. How Many Calories Does a Cycling Class Burn?